From left: Rose-Ann Green (FOTA-New York), Enneika Farquharson (FOTA-Trelawny chapter), Almond Clarke (FOTA NY), Rose Hamilton-Reeves (FOTA Trelawny), Lorna Jackson (FOTA-Trelawny), and Francis Brown (FOTA-Trelawny) pose for a photo op with Adora Walker (seated), who the association honored for her 30 years of service as a midwife to the community Kinloss in Trelawny. 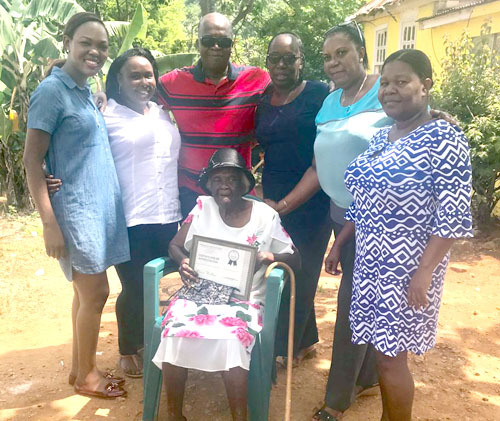 Kinloss, Trelawny/New York based organization, Friends of Trelawny Association (FOTA), has honored community midwife Adora Walker for her 30 years of service. A team from the association travelled from New York, along with members from the chapter here in the parish, to present Mrs. Walker with a certificate of recognition and appreciation, along with goodies and a monetary donation. Each year, for the past 37 years, FOTA has organized a week of activities to help commemorate the establishment of the association by raising funds and awarding persons from the parish of Trelawny who have made or are making significant contributions to their community through their time, actions, talents and dedication. Mrs. Walker, 93, who was featured in the FOTA annual journal, among four other awardees this past May, outlined her extensive work in delivering countless of babies during a time when resources, along with public and private transportation, were not readily available to the small community of Kinloss. Mrs. Walker served the people of Kinloss – the community in which she grew up and also raised her fourteen (14) children with her now deceased husband, Malachi Walker – well. She started delivering babies at the age of 30, but retired when she reached the age of 60 as a result of resources becoming more readily available to the rural community and her mobility decreasing. She was thankful to FOTA for recognizing her for the work she had done. She showed her gratitude by praying a blessing over the team who were on hand to make the presentation. The Friends of Trelawny Association (FOTA) was formally established in 2001 as a non-profit corporation in the state of New York, dedicated to the development of Trelawny, Jamaica. For the past 34 years, founding members have organized annual Memorial Weekend reunion events in the New York/New Jersey metropolitan area, which usually attracts over 4000 patrons each year. FOTA is independent of any governmental/political ideology or religious creed. Its work is guided by the common desire of its members and supporters to find practical solutions to social and economic problems, in the spirit of generosity and respect. The vision of FOTA is to be a visible, vibrant, and influential organization that will maintain contact, interest and commitment amongst people with ties to Trelawny.